Take Your Sharpest Photographs Ever. Tips to Help You Take Your Sharpest Photos Ever. There’s nothing worse than capturing a great image that’s perfect in every way, except, it’s not sharp. At times this can be heartbreaking because it’s usually the best picture from a day’s shooting that you can’t use because it’s just not sharp. In this article we’re going to look at ways to avoid any more blurry, fuzzy, soft or un-sharp images. Each of the points below will make a difference on their own, but using them together will probably offer the sharpest images it’s possible to create. When most photographers start out they will pick up a camera and hand-hold to shoot their images because really, that’s the natural thing to do. For some scenes it’s completely appropriate, it’s quick and easy to grab the camera and fire away. Unfortunately one of the earliest lessons learnt with this approach is how easy it is to take blurry out-of-focus images and should the photographer be keen to avoid this wastage, they’ll want to find ways to stop it immediately. If you only take away one thing from reading this, it’s that a tripod will make a massive difference to the quality of your work. Ask me what one accessory a photographer should buy, I would say a tripod. Fixing the camera on the tripod immediately gives sharper images. The great thing about using a tripod is that you can now use exposures measured not in split seconds, but in minutes, hours or even days. Having this scope extends your image taking options greatly. Landscapes with glass-smooth water, night-time skies full of stars, all of which can be photographed with any aperture and shutter-speed combination you need. It's very liberating and at the same time certainly makes me think about how I'm going to set up the shot because a tripod does add time to the picture taking process. In my opinion, time well spent. There are lots of tripods on the market to suit every budget but I would say buy the best you can afford and don’t skimp. 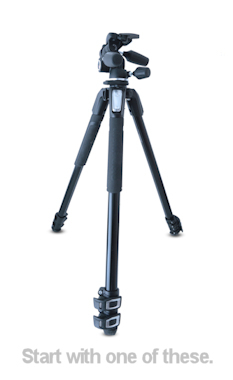 Look at the tripods made by Manfrotto or Gitzo (to name just two of the many) as they make tripod systems, where you can buy the legs and heads separately meaning you can swop them about to suit your needs. I have a Manfrotto tripod where I can swop the heads between a pan-and-tilt head for photography and a fluid head for film work. If you're shooting a lot of landscapes, then weight is likely to be a factor when trekking to those shooting locations. Carbon-fibre is now a common material and it’s low weight makes it ideal for easing the gear-carrying burden. CF tripods are more expensive than others made with aluminium but paying that extra may be worth it to avoid a bad back. Other things to consider include the maximum height to which it will extend, the angles the legs will move out to give a low shooting position, whether the centre column can be adjusted to an angle. What about a quick-release plate to speed up camera changes? Some tripods provide hooks to which heavy objects can be hung to stabilise a tripod even further. This can be handy when shooting in high winds. Always stand the tripod on a firm, stable surface. If you stand it on floor-boards whilst shooting a table-top still-life and those floor-boards move as you walk on them then this will upset the tripod. Even tiny movements will cause shake and spoil the shot. How about shooting a landscape shot on a beach? Is the sand firm enough to take the weight of the tripod and camera without sinking? Even with the camera mounted on a tripod there’s a risk of camera shake and vibration from the motion of pressing the shutter button. 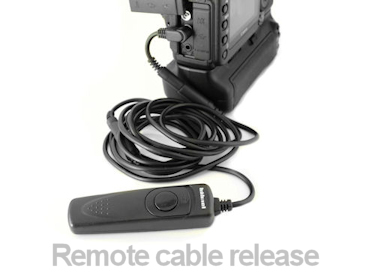 By using a cable release such as that shown here, the photographer becomes completely detached from any contact by taking away the need to touch the camera to fire the shutter. These accessories are widely available and made by camera manufacturers and third-party suppliers too. Some are wired to the camera, others are wireless. Which you choose will depend upon your needs. If you want to fire the shutter from a distance then a wireless solution is ideal however there’s the reliance on battery power. Wired releases don’t use batteries. If the first two options have been implemented that goes a long way to removing vibration and blur from those images but if it’s super critical that any kind of vibration is eradicated, there are a couple of other things to do to stop those vibes. The first is to lock the mirror. This is a setting on the camera (some, not all models), that moves the mirror in to the locked position before the exposure cycle begins rather than including the mirror-up action in the exposure cycle. This avoids adding any vibration to the camera body from the action of lifting that mirror. Of course the vibration from this lift is going to be small but for photographers wanting the absolute most sharpness from their work, this removes the chance of that. This is the second option to really kill off those unwanted vibrations. By using the self-timer, you allow a further delay between the start of the exposure process where the mirror goes up and the exposure begins. This gives more time for any vibration from that mirror up and any other vibration in the camera to disappear. Of course mirrorless cameras don’t have an issue with mirror vibration but the self-timer delay may well offer a benefit. 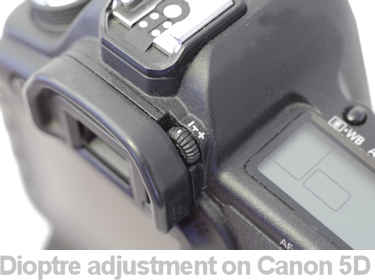 The ISO measures the sensitivity of the sensor (or film, it's the same principle) to light. Lower ISOs such as 160 are used when light is plentiful and higher ISOs are used when there's not so much light. As the ISO increases, the ability of the sensor to capture fine detail is reduced so in order to take the sharpest images, low ISOs should be used whenever possible. If I'm shooting on a tripod, I'll use the lowest I can, depending on the camera I'm using that means anything from ISO 50 to 160. It should be noted that camera technology is moving at a fast pace and ISO sensitivity in low light is improving almost monthly with the release of new camera models so this isn't as important as it once was. I remember a time when shooting on film and using ISO 1600 the grain was like golf balls and really looked soft and unsharp. Now ISO can be used to take very acceptable images. How times have changed! No article about reducing blur and increasing sharpness would be complete without a mention of shutter speeds. Simply put, slow speeds like 1/10th increase the risk of blur and shake whilst a fast speed like 1/500th reduce the risk. Some photographers have the ability to hand-hold a camera at very low speeds without loss of sharpness but for those of us who can't do this, then using faster speeds is the only answer. Where your threshold is can only be found with experience and trying out those speeds to see at what point your images lose sharpness and become soft and blurred. Just don't test this on any important images. Do the experimenting before you take something that has to be right. For those times when you can't use a tripod or other supporting device, fast shutter speeds will be the best option however you have to work with an appropriate aperture and ISO too so that faster speed might reduce the shakes but does it give you the best exposure for your image? Faster shutters mean wider apertures or higher ISOs or both. A wider aperture means less depth-of-field and therefore less sharpness. If that's what you want from the image then that's great but if you're trying to shoot a landscape then the better option might be to turn to that tripod. Only you can decide what's best for the image you want to take. So many decisions eh? There's never one answer and that's what makes photography all the more interesting. To find out more about shutter, aperture and ISO take a look at our basics of photography article here. Whilst the solutions above look to reduce vibration and shake there are other things that increase the sharpness of the image. Lens quality has a big impact on sharpness. Unfortunately for the photographer and filmmaker, quality comes at a cost. The best lenses offering that lovely sharpness are usually the most expensive with the odd exception. One of those exceptions is the 50mm lens. Notably the f1.8 versions from Canon and Nikon, these are very sharp and yet quite cheap. Always a good addition to any kit. It’s the maximum aperture that makes the lens expensive. Compare a short zoom of say 24-70 f2.8 with something with a max aperture of say f5.6 and you’ll see how that wider aperture means more money. It's my opinion that you should only invest in the best quality lenses (or 'glass' as photographers like to call them) you can afford. The more expensive models give you sharper images with less distortion and chromatic abberation (CA). The best lenses will have a wider aperture such as f2.8 or F4 on the longer telephoto lenses like 600mm (that's a big lens!) These types of lenses are aimed at the professional and serious amateur photographer. Budget lenses usually come as part of a kit, bundled with a camera body and probably aren't up to much so avoid these. Personally I would rather have better quality lenses and go down to a lesser body spec as quality glass is more important to me than the body. Image stabilisation is a very popular feature on many lenses now and extends the range of shutter speeds you can use when hand-holding the camera with the lens. Not all lenses have this but if you expect to spend a lot of time shooting hand-held then it can help with increasing the numbers of useable shots you take. You don't have to buy the lenses made by your camera body manufacturer as there are third-party companies making great quality lenses cheaper with little or no loss of image quality. So look out for independent lenses from the likes of Tamron, Sigma and Tokina to name a few of the well known brands. f22 – a small opening, less light enters the camera and greatest Depth of field. The smaller the aperture, (in terms of opening), like f22, the greater the depth of field with more of your scene will be in focus. This is useful when you take a landscape and want to ensure everything in your view is in focus. When you, or your camera, focuses on a point in the scene you are photographing, the aperture will determine how much in front and behind your selected focal point is in focus. Of course you don’t have to use the smallest aperture, you can select any one in your lens’s range and each one will give you varying degrees of depth of field. I very often use f5.6 as this gives me a reasonable focus area but the reduced DOF beyond the subject gives me a pleasant out of focus, or blurred area. This emphasises the sharply-in-focus subject. (This technique is great for portraits). One point to remember here. That the DOF will change dependent upon the focal length of the lens you use. For instance a 50mm lens at f11 will have more DOF than a 150mm lens at f11. By selecting the appropriate aperture, you decide how much light enters the camera and what parts of the scene you want in or out of focus in the final image. This is a very powerful tool. The sweet spot of a lens is when it’s at it’s sharpest and will be found by adjusting the aperture of the lens. It’s likely to be somewhere in the middle, that is, not at it’s widest opening nor it’s smallest. This will be different for each lens so some research will be required to find it. Knowing this doesn’t stop me using the other apertures, I still use the smallest, f22 or smaller through to F1.8 depending on what effect I wish to achieve from the shot but it’s a useful feature to know about if you can work within the middle of your aperture range. Some cameras offer an adjustment within the viewfinder that compensates for the photographer’s eyesight. It‘s worth checking if the camera you’re using has this as even if you don’t need it, it could be incorrectly adjusted and so your ability to see an accurately focussed view is compromised. Even when using auto-focus, if this is incorrectly adjusted for your eyesight, the scene will appear out-of-focus even when the camera is correctly focussing. If auto-focus isn't entirely accurate, some cameras allow the photographer to adjust the auto-focus in-focus point. How this works will be different on each camera so some research may be required. So far all of the techniques and suggestions were about things to do with your 'hardware' such as lenses, tripods and camera settings. We couldn't have a complete article about sharpening without mentioning sharpening whilst editing the picture with your software. Because of the differences in sharpening tools across the many editing packages we can only generalise but here are some points to consider. If your original unsharpened image is not really sharp straight out of the camera, no amount of edit sharpening will fix that. Once fuzzy, always fuzzy, so get it right in camera! The sharpening you do in post should enhance what is already there. Don't oversharpen an image as this adds odd looking, ugly pixels. Always view your image at 100% when sharpening to check that you aren't over-sharpening. Some pictures need more sharpening than others because of the lens used to take the picture. This varies from lens to lens so some experimentation on your part is neccessary to find out how much to apply. Remember too, that any image you shoot for stock might not need to be sharpened as the library prefers non-sharpened images. So, to take your sharpest ever image, use a tripod, with a cable release, lock up the mirror, delay the exposure with the self-timer, use a low ISO, an aperture that hits the lens sweet spot, use the best quality lens you can afford and carefully sharpen your images in post.